With a number of domestic championships out and about over the past fortnight there was ample opportunity for numerous Sunoco Whelen and 240 Challenge drivers to consolidate their strong start to the season or significantly increase their average score with a standout weekend. In the end Colin Noble Jnr maintained his place at the head of the Whelen standings, while Shane Kelly moved into the 240 lead after early pace-setter Bradley Smith failed to compete at Spa-Francorchamps. Colin Noble Jnr remains comfortably clear of his rivals in the race to land 2018’s Rolex 24 At Daytona prize drive after other leading contenders faltered during their latest outings. The Henderson Insurance Brokers LMP3 Cup front-runner retained his championship lead at Brands Hatch a fortnight ago but initially saw his Sunoco Whelen Challenge advantage slashed – due to the low grid count – despite finishing first and second in the event’s two races. A loss of 18 points resulted in his average score dropping to 101.88, enough to keep him just ahead of British GT4 Pro Stuart Middleton. British GT’s latest outing at Snetterton last weekend therefore offered Middleton, HHC Motorsport co-driver Will Tregurtha and a host of others the chance to apply real pressure to Noble Jnr. Victory and fastest lap in Sunday’s first race put Middleton in the driving seat, only for a DNF in Race 2 to dent his weekend’s average. He therefore remains second and 16.08 points shy of the lead, while Tregurtha slips to fifth with 77 points. The HHC duo’s misfortune played into the hands of their British GT4 title rivals Alex Reed and David Pittard who also boosted their Whelen chances with two second place finishes at Snetterton. The Lanan Racing duo move up to joint-third, 4.4 points behind Middleton and the same number ahead of Tregurtha. LMP3 Cup’s Thomas Randle is now sixth but only 0.18 points ahead of Sandy Mitchell whose victory and third place at Snetterton helped the Scot continue his ascent of the British GT4 and Sunoco Whelen Challenge tables after suffering a disastrous first weekend two months ago. GT4 class rival Mike Robinson completes the top-eight 2.2 points further back. Elsewhere, the fight for the top-10’s outer reaches is incredibly tight between four drivers. Radical European Masters SR3 racer Stuart Moseley holds a 0.2-point advantage over British GT3 Pros Matt Griffin and Sam Tordoff, as well as Mitchell’s co-driver Ciaran Haggerty. All four are little more than 30 points behind current leader Noble Jnr. Bradley Smith went into the latest Sunoco 240 Challenge round with a commanding lead in the standings. However, failing to attend last weekend’s Radical Challenge round at Spa-Francorchamps saw him record zero points, which dropped him to 29th and – realistically – out of contention for the 240-minute Daytona support race prize drive. That has promoted Shane Kelly to the top of the pile following his impressive start to F3 Cup’s 2017 campaign. And with the season continuing this weekend at Silverstone, there’s another chance to increase his 112.5 total. However, in the same paddock will be nearest rival Jessica Hawkins whose Mini Challenge R50 Cooper programme also resumes this weekend. The pair are currently separated by just 0.83 points, a difference that’s bound to change throughout the event. British GT3 Am Jon Minshaw heads a group of drivers keeping a close eye on events at Silverstone this weekend. The championship leader came within a drive-through penalty of winning Race 2 at Snetterton on Sunday but maintained his chase of the Sunoco 240 Challenge front-runners with fastest Am time in qualifying and victory in the opener. His 107.8 points therefore leave the Barwell driver third, 4.7 behind Kelly but 7.92 ahead of LMP3 Cup championship leader Alasdair McCaig who finished first and second at Brands Hatch seven days earlier. Reigning British GT4 champion Graham Johnson remains a fixture in the top-six, albeit only 1.5 points ahead of Rick Parfitt Jnr whose solid British GT3 results were boosted by fastest Am laps in both of Snetterton’s races. Brett Smith went into his weekend 16th but is now the only Mini Challenge JCW driver inside the top-20 after climbing nine places to seventh as a result of two wins and fastest laps. His average score of 83.57 is almost 10 shy of Johnson but 3.57 more than Jacopo Sebastini who, like F3 Cup rival Kelly, can see his total increase – and decrease – this weekend. 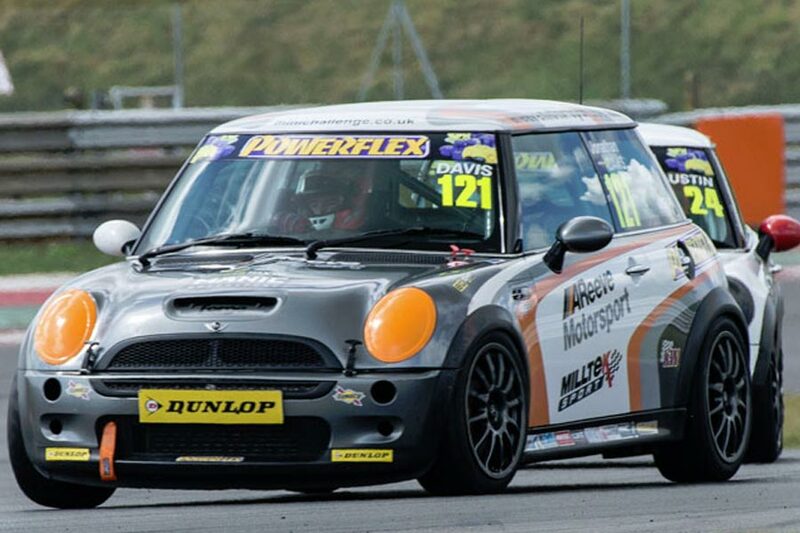 Silverstone’s Mini Challenge R50 Cooper event also offers Richard Newman a chance to move up the table, while reigning British GT3 champion Derek Johnston is back in the top-10 after winning Race 2 at Snetterton.